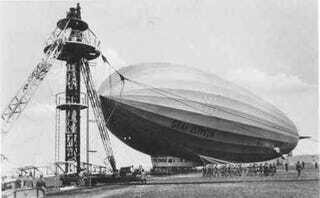 What was life really like for people who worked on zeppelins back in the nineteenth century? Was it all swashbuckling adventure, or were they helium-poisoned prisoners of the sky? In her incredible new short story, Genevieve Valentine has the answer. And oh, it's a glorious life! The balloon of a Phoenix-class airship is better than any view from its cabin windows; half a mile of silk pulled taut across three hundred metal ribs and a hundred gleaming spines is a beautiful thing. If your mask filter is dirty you get lightheaded and your sight goes reddish, so it looks as though the balloon is falling in love with you. When that happens, though, you tap someone to let them know and you go to the back-cabin Underneath and fix your mask, if you've any brains at all. If you're helium-drunk enough to see red, soon you'll be hallucinating and too weak to move, and even if they get you out before you die you'll still spend the rest of your life at a hospital with all the regulars staring at you. That's no life for an airship man. I remember back when the masks were metal and you'd freeze in the winter, end up with layers of skin that peeled off like wet socks when you went landside and took the mask off. The polymer rubbers are much cleverer. I've been a conductor for ages; I was conducting on the Majesty in '78 when it was still the biggest ship in the sky-you laugh, but back then people would show up by the hundreds just to watch it fly out of dock. She only had four gills, but she could cut through the air better than a lot of the six-fins, the Laconia too. They put the Majesty in a museum already, I heard. Strange to be so old and not feel it. At least the helium keeps us young, for all it turns us spindly and cold. God, when we realized what was happening to us! But they had warned us, I suppose, and it's fathoms better now then it was. Back then the regulars called you a monster if they saw you on the street. The coin's not bad, either, compared to factory work. They say it's terrible what you end up like, but if you work the air you get pulled like taffy, and if you work in the factory you go deaf as a post; it's always something. I'm saving a bit for myself for when I'm finished with this life, enough for a little house in the Alps. I need some altitude if I'm going to be landlocked; the air's too heavy down here. Read the rest of "The Zeppelin Conductors' Society Annual Gentlemen's Ball"